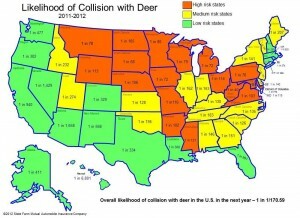 Iowa remains one of the country’s most dangerous states for motorists hitting a deer. An insurance company study finds West Virginia is the most likely place to have a run-in with Bambi, followed by South Dakota and Iowa at number-three. State Farm’s Ann Avery says that’s a slight slip for the Hawkeye State on the national rankings. “Iowa has dropped from 2nd to 3rd place in the list of states where a collision with a deer is most likely, based on our analysis,” Avery says. “That means, in Iowa, the chance of a motorist hitting a deer in the coming year is one in about 72.” She notes, those wrecks aren’t cheap. “The average property damage cost of these kinds of incidents, in the final half of 2011 and the first half of 2012, was about $3,300,” Avery says. “That’s up 4.4-percent from the year before.” The number of deer-related collisions nationwide has risen by nearly eight-percent from last year. While it may be impossible to be immune from deer collisions, Avery reminds drivers to take as many precautions as they can and to stay alert. If a deer collision appears inevitable, remember the slogan “Don’t Veer for Deer,” as if you try to swerve, you could end up in the ditch or in on-coming traffic. Also, use high beam headlights as much as possible at night to illuminate the areas from which deer will enter roadways — and don’t rely on car-mounted deer whistles. The state in which deer-vehicle mishaps are least likely is Hawaii (1 in 6,801). The odds of a driver in Hawaii colliding with a deer are nearly equal to the odds of being struck by lightning.